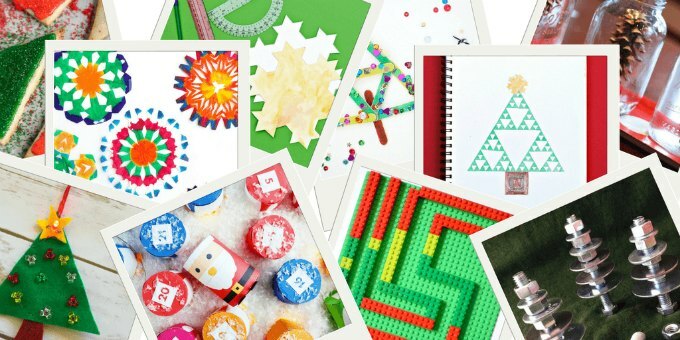 You are here: Home / Learn / Science / Christmas Science Experiments You Will Actually Want to Do! I know you are looking for something unique for the holiday season, something that doesn’t involve baking 25 dozen cookies. Am I right? Something you can do with your kids that doesn’t involve listening to Jingle Bells over and over? Something that does involve “Christmas Science Experiments”???? You’re reading this post because you trust me, you know I really dislike paper plate snowmen and highly fussy activities, especially when I feel overwhelmed with the regular day to day life of being a parent. You know I love family activities that involve a little learning. And that are easy. And that are fun. 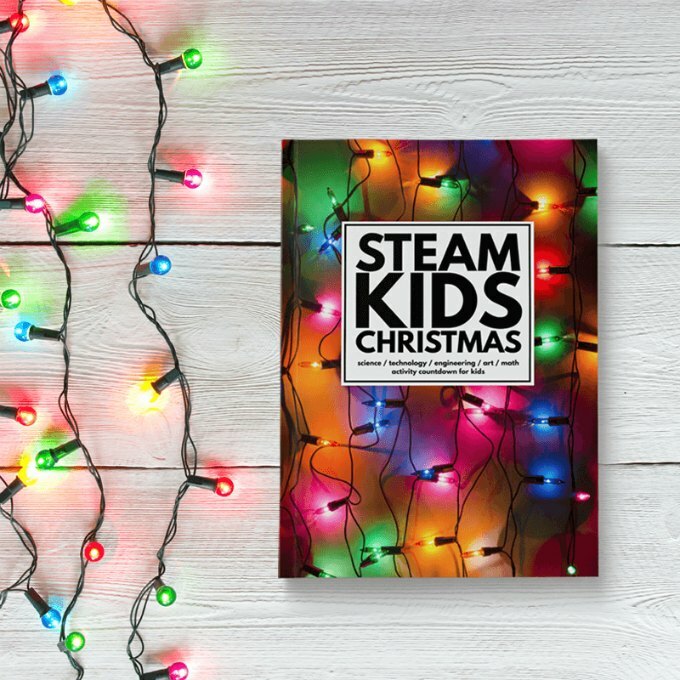 So, I know you will want to investigate the STEAM Kids Christmas book edition. Why would I want yet another thing to add to my holiday to-do list!! Do you make ornaments every year? We’ve got unique ideas! Do you have a family gathering coming up? Have the cousins get together and build snow blocks, or engineer a Christmas tree out of hardware instead of watching TV! Do you need after school boredom busters? Set out a tinker tray! Are you traveling? 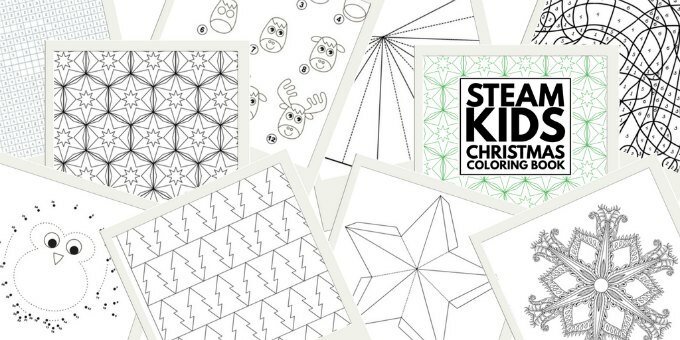 Five words: STEAM Kids Christmas coloring book. Are you at home during the school break? ‘nough said. These ideas do not have to be done between Dec. 1 and Dec 25. They are excellent for year round fun. Complicated projects that you can’t figure out, don’t have time for or need to spend lots of money on. I contributed two fantastically awesome fractal math art projects to the book. Holiday. Fractal. Math. Art. What more could you want to make your holiday fantastic? (Hint: all the other STEAM projects in the book.) 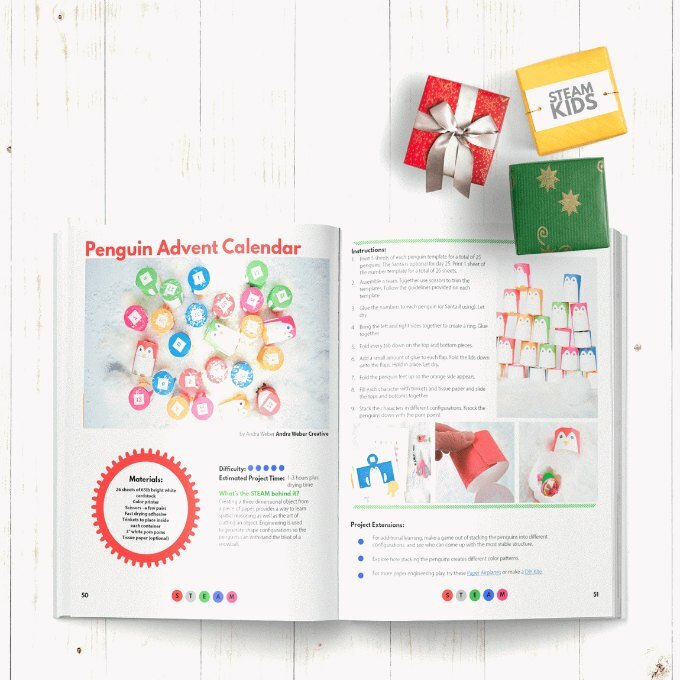 The book contains Christmas science experiments like a candle windmill, holiday-themed engineering projects like building a jingle bell maze, mathematical brain teasers like geometric ornaments and artistic science explorations like psychedelic snowflakes. And not only that, but our team has put together an amazing STEAM advent calendar for you and your kids. And get this, it is penguins! Penguins! The cutest bird in the world. Image your relief at not having to watch your kids get excited every morning over a stale piece of chocolate behind a teeny tiny now-ripped door. But wait! There’s more (as they say on TV). 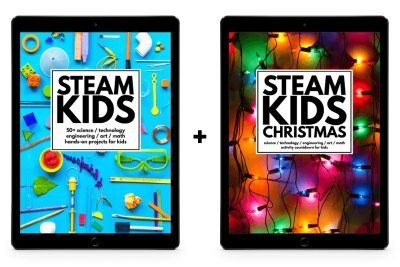 And if you missed original STEAM KIDS, now is your chance to get both books. Plus the coloring book, don’t forget! 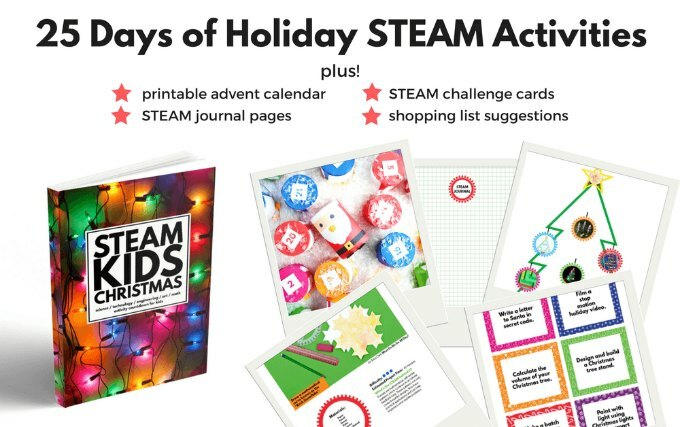 So now you are at the end of the post and if you still aren’t ready to take the plunge into Christmas STEAM fun, why not sign up for the email list and get a free sneak preview of the book?? The Not-Fine Print: The ebook purchased from the STEAM Kids website is delivered as a digital pdf. 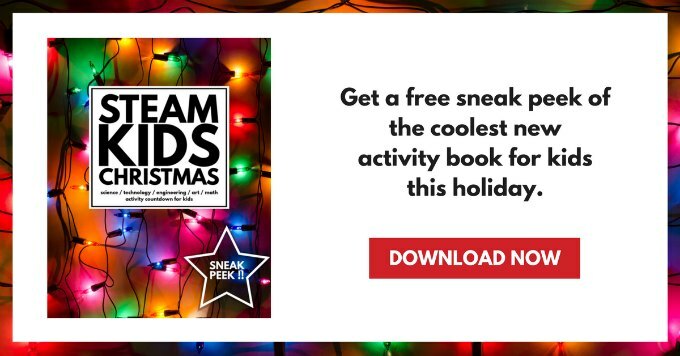 Customers who purchase the STEAM Kids Christmas book via Amazon can send a copy of their receipt with order number to steamkids@leftbraincraftbrain.com to qualify for the free Christmas coloring ebook. The coloring book is not available as a print book – you print it out at home. The three book bundle is only available as digital download on the STEAM Kids website. Alas, it is not available to Amazon customers, due to circumstances beyond the authors’ control. What age are the STEM activities appropriate for? Ages 4-10. Thanks for asking, I added that in! I like this: Want Your Kids To Love Being Unplugged – the books are only available as e-books. Unfortunately my kids have already been plugged and if I try to show them an e-book, they are going to grab my tablet and run off with it. They will end up surfing all over creation and never doing any of these activities. A book would be much more…appropriate.